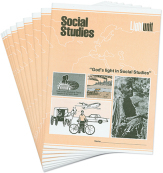 The five LightUnits of Sunrise Social Studies 100 develop the concept of communities that make up our world. Each LightUnit contains sixteen lessons, two quizzes and a test. First graders learn about families, courtesy for others, communication, community living, and even a bit of North American history. Students will enjoy the stories about four children who live in different parts of our continent. The Teacher’s Guide contains thoughts and ideas to help you teach creatively and effectively. It includes a reproduction of each LightUnit page with answers and is required for the course. 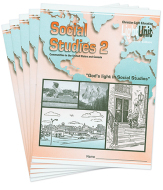 These five LightUnits on families, neighborhoods, communities, and their relationship to the larger world advance the concepts begun in Social Studies 100. 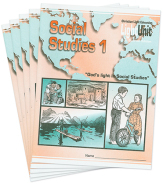 Each LightUnit contains seventeen lessons, including two quizzes and a test. The Teacher’s Guide contains thoughts and ideas to help you teach creatively and effectively. It includes a reproduction of each LightUnit page with answers. Answer keys are optional if the Teacher's Guide is purchased. 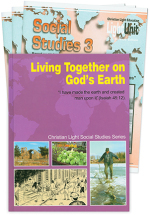 This course uses the text Living Together on God’s Earth, a study of communities. The student first recognizes his community as one small part of the earth, then explores four communities of Bible times, one European community, one American community, and the old and new countries of Israel. You have two options for this course: use the LightUnits study guides, or follow the textbook exercises. Both options require the textbook. The LightUnits provide exercises, daily review, quizzes, and tests. LightUnit 306 is optional for those preferring a five-LightUnit course. Teacher materials include LightUnit answers, discussion/activity ideas, and reproducible maps. Answer keys are optional if the Teacher's Guide is purchased. For a textbook study, use the questions provided in the text. Teacher material for this method contains answers to these questions, discussion ideas, reproducible maps, and answers to the test questions. A separate test booklet contains all the tests needed for one student to complete this course. For map activities, purchase the student pack of outline maps or use the masters in the Teacher's Guide. 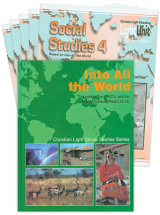 The textbook Into All the World invites students to tour the world, learn the geography of each continent, and discuss stewardship of the resources God has supplied. The writing style is interesting and conversational, the book filled with pleasing illustrations. You have two options for teaching this course: use the LightUnit study guides, or follow the textbook exercises. Both require the textbook. Either method provides a whole year of lesson material. The LightUnits provide exercises, reviews, quizzes, and tests. Teacher materials include lesson notes, discussion/activity ideas, and reproducible maps. Outline maps are also available as individual student packets. For the second option, use the questions provided in the textbook. This method requires more teacher interaction for review and test preparation. Teacher material contains answers for the text, discussion ideas, extra map work, and reproducible maps. Tests packets are sold separately. Individual student map packets are also available. North America Is the Lord’s is a comprehensive history and geography of Anglo-America from a God-centered perspective. This study credits God, the Creator, as the sovereign Lord. It describes opposing forces in history: the kingdom of God and the kingdom of darkness. Social values belonging to God’s kingdom are upheld. This book counters the humanistic idea that we control our destinies, and that our land thrives because of our own ingenuity. You have two options for this course: use the LightUnit study guides, or follow the textbook exercises. 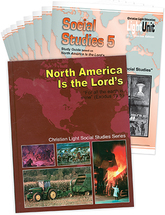 The Study-Guide LightUnits are self-directed study guides for the textbook. Each LightUnit includes two quizzes, a self check and a test. For a textbook study, use the study-by-textbook materials in place of the LightUnits. Test packets may be ordered separately. 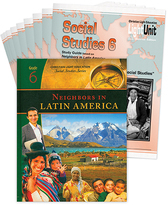 Social Studies 600 is based on Neighbors in Latin America, a beautifully illustrated full-color textbook. 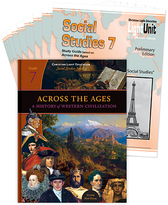 Units 1-4 cover the early history, geography, and climate of Latin America as a whole. Units 5-10 divide Latin America into regions and give specific information about the major countries in each region. A limited number of activities appear in the textbook, designed to review only the highlights. For student work activities, choose either the workbook study or the LightUnit study for better coverage of the material. Either option is a full-year course. The ten LightUnits match the ten units of the textbook. Two quizzes and a LightUnit test are included in each LightUnit. The two-workbook option provides one worksheet per lesson and will require more teacher input. This option includes a pack of quizzes, reviews, and tests for each student. Across the Ages takes students through human history from Creation to the early 21st century a.D. This full-color text describes the course of Western civilization while highlighting the hand of God at work in world events. sidebars, tidbits, and “insight boxes” provide additional context, and the Going Global feature expands the scope beyond Western civilization to cultures and empires around the world. The LightUnit study provides self-directed exercises. Answer keys are required. The Worksheet study requires more teacher input. Answer keys required. History is what happened. But, what is recorded as history is not always what happened. 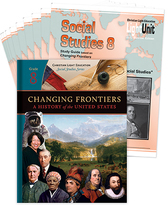 Changing Frontiers attempts to look at United States History honestly and fairly. In this full-color text, students learn about pre-Columbus Americans, European discoverers, explorers, and colonists. They follow American history through the formation, growth, and struggle of the nation. Sidebars and extra info nuggets, along with “perspective boxes,” sharpen students’ understanding of history. Study and discussion questions conclude each section. The LightUnit study provides self-directed exercises, quizzes, reviews, self checks, and tests. Answer keys are required. The Worksheet study includes chapter tests, reviews, and unit tests and requires more teacher input. Answer keys required. Each LightUnit contains one self test per section and one LightUnit test. For a full year’s study, each LightUnit must be completed in about three weeks.